Indeed, it should be included in the constitution and therefore law that Church and State are separate. After all that's what it says in the US constitution and there is no problem there with the line between Church and State getting blurred. Hahahahahahahahaaha! Nuts, I almost got through that with a straight face. 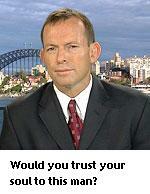 Don't forget, the Australian people voted for The Mad Monk. We get the politicians we deserve. Well, that may be because everything is a blur for Dubya. (And Blur were a great band). However, I'll have you know that not only did I not vote for Abbott, I've handed out Labor how to vote cards at every election since I was 18. They like people like me to hand them out as people are less likely to tell young girls to shove it. However by 2004, that tactic didn't work anymore. Well, unfortunately while the Libs are the lowest of the slime pile, Labour is only one rung up from there. Want democracy? End duopoly. And don't vote. It only encourages them. We don't have a choice about voting! And yes, I've submitted Xander...I always knew he was a star. Well you do have a choice when you think about it. 1. Donkey vote. Officially this means the vote is discounted, but I wouldn't trust this one to those politician slimeballs. 2. Vote 5 for everybody on the ballot paper for the lower house and 95 for everyone in the upper house. 3. Cough up the $50 fine. Small price to pay to register a protest vote. There is always choice. It's the most important thing a person can every have.